Is Ferguson’s Ron Johnson the New Captain America? The media find the hero they’ve been looking for. “Leadership, thy name is Ron Johnson.” So announced Mike Huckabee yesterday on Fox’s Outnumbered. Even as the image of Michael Brown, the unarmed black teen killed by a Ferguson, Missouri, policeman, was being tarnished by a video allegedly showing him stealing from a convenience store, the media had already found the hero of their story. 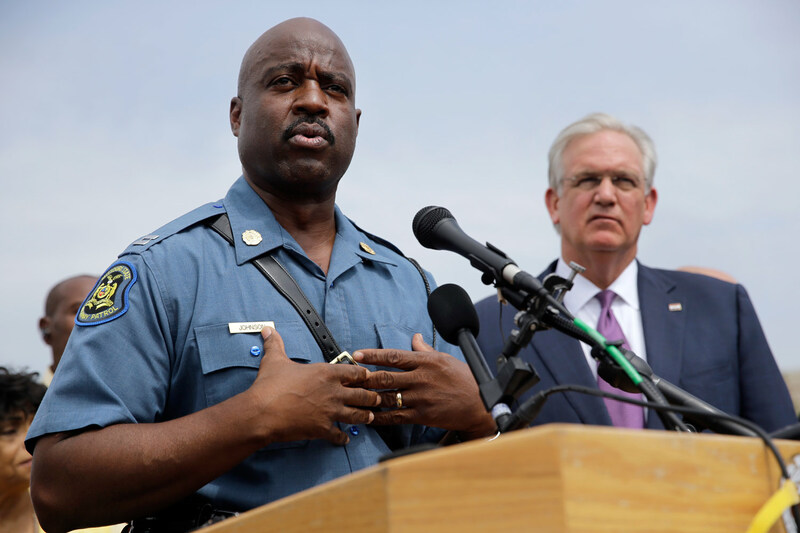 He was Ron S. Johnson, the State Highway Patrol captain now in charge of law enforcement in the St. Louis suburb. He’s just what most media want—someone who seems to transcend the left/right and black/white divides and can bring people together. Thursday night, the bald, buff African-American state officer banished the militarized St. Louis County police force and walked with protesters to oversee a peaceful, almost joyous demonstration. Johnson, who was raised in the area, hugged demonstrators, told several young men with tattoos that his son has tats too, and, most important, listened to people. Such a charismatic black male was not around in the aftermath of previous police and would-be police shootings of young black men, not for Trayvon Martin or Jordan Davis, when their deaths became potential teaching moments. Those stories ended up as yet another nasty excuse to battle publicly over the nature of black men—are they choir boys or thugs? The schism has become such a media trope that after Brown’s killing, African-Americans started posting side-by-side photos of themselves at #iftheygunnedmedown, one that seems to confirm a “gangsta” stereotype and one that doesn’t, and speculating on which one the press would feature if a cop shot them. By the weekend, Johnson had all but replaced Brown as the central figure in Ferguson’s drama, a protagonist both sides were eager to celebrate. Of course, it’s slippery at the top, and you never know how long media approval will last or how events will change. Last night, according to NBC News’ Mark Potter in Ferguson, a few rocks and bottles were thrown during the demo, and police threw “some” tear gas. After midnight, he said, looting started again, but protesters tried to stop it. But there’s no denying the service Johnson has done for his community by defusing an apparent police riot that had gone on for most of a week. He doesn’t walk on water, but he acted bravely in the eye of a national media storm. And not everyone can do that. Nowhere was that made clearer than when Johnson stood next to the nervous and evasive Governor Jay Nixon. Nixon is a cautious Democrat who nonetheless found the courage last month to veto a critical anti-abortion bill. Interviewing both of them on Friday, CNN’s Jake Tapper said the St. Louis County police apparently hadn’t bothered to contact some eyewitnesses. Was the governor concerned about the quality of the investigations? Nixon, deferring to other law enforcement agencies, wouldn’t quite answer.